The rotary engine is alternative of the reciprocating engine. 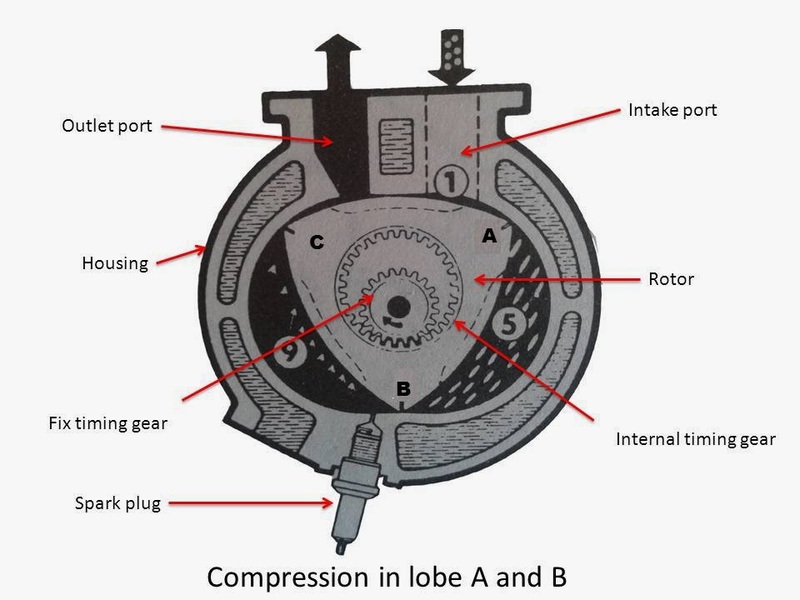 It is developed by Wankel in the year 1957. In rotary type of engine the pressure force generated by the combustion of fuel is exerted on a rotor. So the rotor revolves and converts the chemical energy of fuel into mechanical energy. This engine is compact and it has high power weight ratio, so this is widely used in submarines and helicopters. In a rotary engine a triangular shaped rotor is used. It has three convex faces. Each faces act like a piston. The rotor works as the prime mover in the rotary engine. 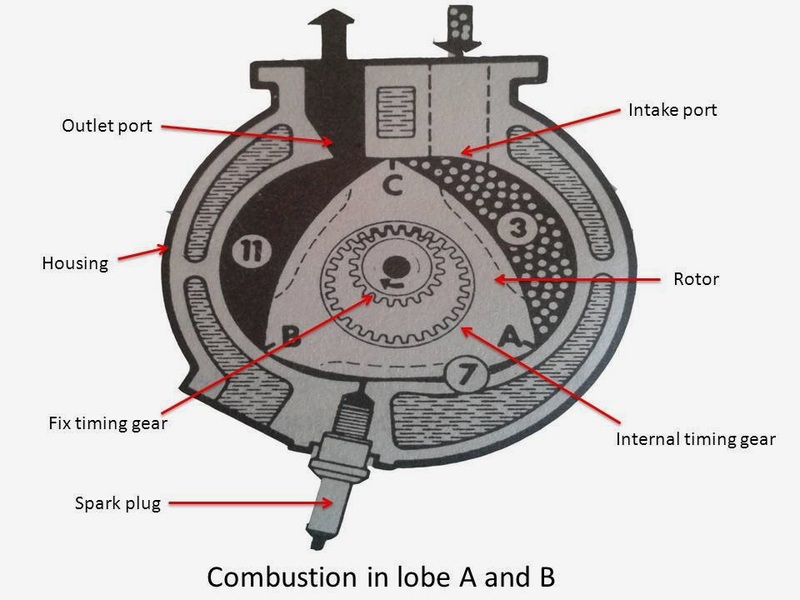 The force generated by the combustion of fuel is directly exerted on the rotor, so it rotates eccentrically. The rotor has an internal timing gear on one side, which mash with the fix timing gear, situated on the side housing to maintain correct relationship between rotor and eccentric shaft. The rotor spin in the oval shaped chamber known as housing. The function of housing is same as the function of cylinder in the reciprocating engine. Housing contains inlet and outlet port, spark plug, water jacket etc. The main housing is closed by use of side housing. Side housing contain a fix timing gear which mashes with the internal timing gear and maintain correct relationship between rotor and eccentric shaft. It is usually made by aluminum silicon alloy. Eccentric shaft, which is also known as the output shaft is used to convert the eccentric motion of rotor into concentric motion and carry it out from engine. All sides of triangular rotor works as the piston. So it is necessary to seal this entire chamber with one another. 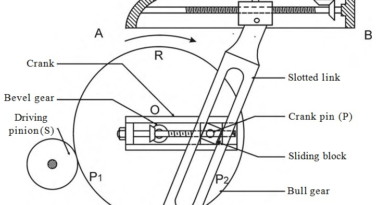 To fulfill this function, apex seal is used to each corner of rotor. It is gas tight sealing between rotor and housing. It is usually made by cast iron and sometime by high carbon steel. 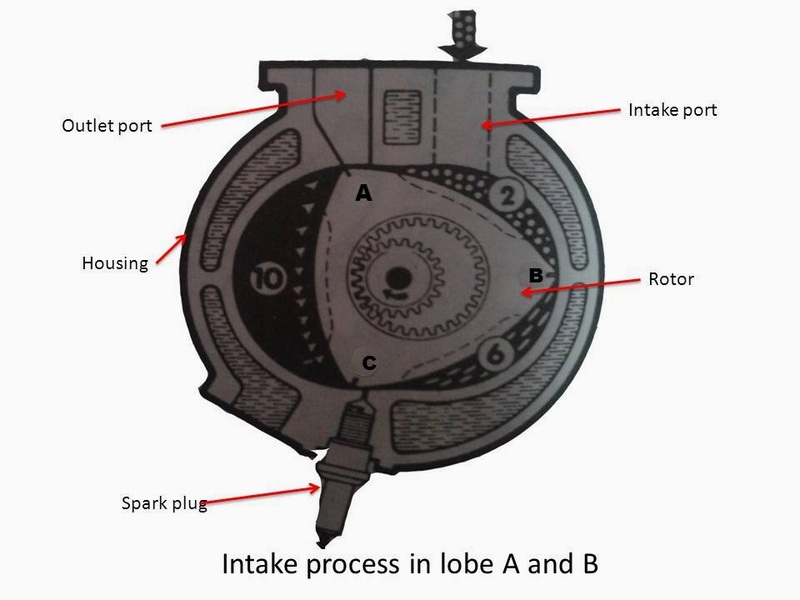 The energy converting process in a Wankel rotary engine is divided into four processes. These are intake, compression, power and exhaust. All processes are going on at the same time around each rotor while the engine is running. The engine has three lobed. The rotor driven eccentrically in the casing in such a way that there are three separate volumes trapped between the rotor and the casing. These three volumes perform induction, compassion, combustion and exhaust processes in sequences. Intake is mean to intake of air fuel mixture into the engine. When the lobe A moves, the space between lobe A and C expands. This cause air fuel mixture enters into engine through inlet port to fill the space. When the lobe C passes the intake port, the space between A and C sealed off. When the mixture between A and B compressed completely, a spark generate at the spark plug which ignites the mixture. It burn and force the rotor to turn. It is also known as power generating process. When the lobe B passes the exhaust port the burn mixture exhausts. 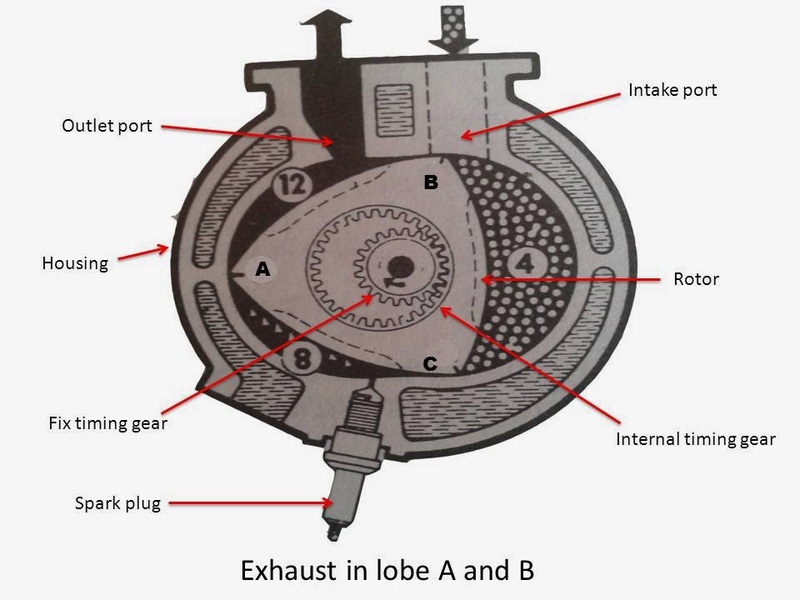 These strokes of intake, compression, combustion and exhaust follow continuously in each rotor chamber. This occurs as long as the engine is running. 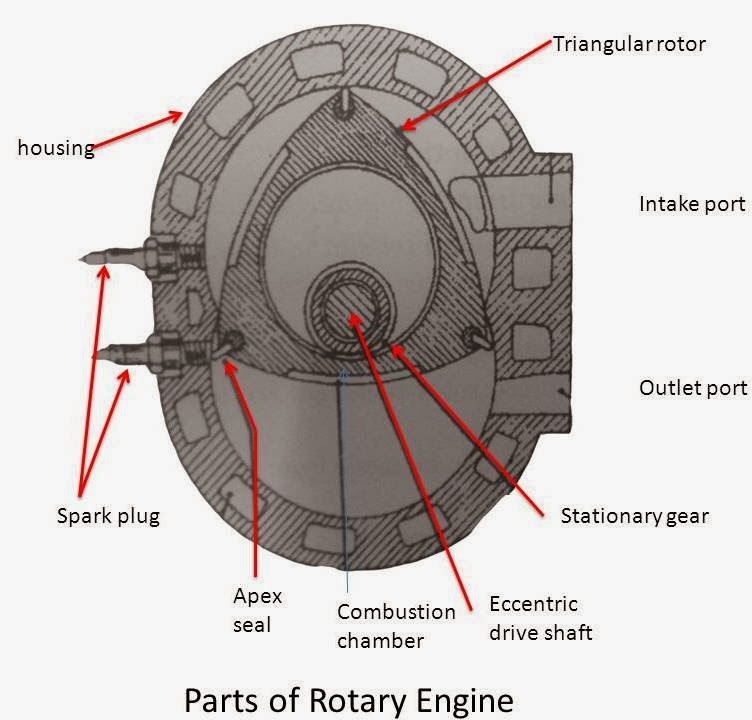 Today we have discussed the Rotary Engine : Main Parts & Working. If you have any query, ask by commenting. Interesting article. It is very unfortunate that over the last one decade, the travel industry has had to tackle terrorism, SARS, tsunamis, flu virus, swine flu, and also the first ever entire global economic collapse. Through it all the industry has really proven to be strong, resilient and also dynamic, obtaining new approaches to deal with adversity. There are generally fresh difficulties and chance to which the market must once more adapt and answer.